This falls squarely into the Miracle category - because I spent the whole time meditating and talking to Source/Essence/God/Cosmic Consciousness - whatever you want to call her and however you want to visualize him - that works for me. Supercalifragilisticexpialidocious seems as good a word as any for mind-blowing, amazing, incredible, life-changing, awe-inspiring, peaceful, exciting, loverly, happy-making, faith-inducing, awesomesauce two weeks that I had in Brazil with John of God. I am still grokking all of the good things that are filtering down as I stand here in absolute Faith that all is well (something that I had received glimpses of prior to going and that I am currently swimming in). As I shared with a friend of mine, I am surfing on a wave of Joy! "You know Corinna, that joy never has to end. You could ride that wave FOREVER!" So that is my plan. I am going to work on riding this wave forever. Set my intention to be filled with love and light and love. Did I mention love? Here are some pictures from my time down there. I would have a video from John of God doing surgeries, but I was in the current room, bathed in bliss (and you can find those very easily on YouTube). We arrived to Brasilia, visiting a peace temple before arriving to Abadiania. Our pousada was very heavily barricaded, one had to be buzzed in to gain access to the hammocks and the parrots in the garden. The Casa is blue and white, peaceful, relaxing, beautiful, full of light and love and love. (Did I mention love?). It is bumping Wednesday through Friday, when the Entity is present. Otherwise it is mostly quiet ... mostly. Every Wednesday through Friday many people gather in the great hall to be seen by the Entity - people from all ALL over the world. I am once again so grateful that English is my first language - everything at the Casa happened in Portuguese and English. Here is our group with Medium Joao, after two weeks of bliss. I am filled with peace, love, excitement, faith, hope, compassion, anticipation, learnings, and miracles - Supercalifragilisticexpialidocious!!! Hello John of God. Goodbye phone. I have seen John of God twice at Omega in Rhinebeck. He is not coming this year, so Mohammad is coming to the mountain. When I was in Germany one of the fabulous people I met there had a video of him and was making noises about a trip to see him. I became re-invigorated and took my own plunge to make the arrangements to join a group heading down (or up, depending on what side of the equator you are on...). I have packed just white (because it was early and I didn't want to think too much), I am not bringing plugs for phones, or wireless, or computers, or the kindle... I am bringing A Course in Miracles, a notebook, my mala beads, (perhaps a small camera so I can record what happens on these pages), and me. I am in edibleWOW's Spring 2011 issue! I applied to write this article over the summer and they accepted! Now it is around and about SE Michigan (and there are green eggs on the cover, which makes me happy). Organized by The Glynwood Institute for Sustainable Food and Farming, the brochure describedÂ TEDxManhattan: “Changing the Way we Eatâ€ as “an awe-inspiring, all day TEDx event focused on sustainable food and farming.â€ I was in awe to be able to attend the event in NYC on Feb. 12. During the course of the presentations from the diverse group of food advocates, farmers, food policy experts, and food lovers, I was reminded of those facts. But I also learned new information – the new information thus giving this member of the food choir new songs to sing. For those of you who watched the livestream at home, or at one of the viewing parties (perhaps hosted by Slow Food Huron Valley) the beginning of each of the three sessions started with a speaker from a TED conference delivered elsewhere. For those of us in the NYC audience we were watching a TED video on the screen along with people at home. Here is her talk if you are curious. Ken Cook, of the Environmental Working Group, gave a rallying cry for citizen activism with his Farm Bill breakdown. “The Farm Bill is a food bill,â€ and “Twenty-two Congressional districts receiveÂ half of all food subsidies,â€ and “40 percentÂ of our corn crop is going to produce 4 percent of our fuel.â€ The next Farm Bill is slated for 2012; now is the time to call your Congressman. EveryÂ nine minutes, a new perspective came to the podium: “Vote with your forkâ€ (Josh Veirtel, Slow Food USA President), “if we are going to solve the health care problem we are going to have to solve the food problemâ€ (Michael Conard, Columbia University), and “when we hand over these problems to specialists that is when we get into troubleâ€ (Britta Riley, Windowfarms.org). EveryÂ nine minutes a new story came to the podium: Elizabeth U on social finance, Dr. Melony Samuels on her anti-hunger project in Brooklyn, Dr. William Li on the role of nutrition and angiogenesis and Professor Frederick Kaufman’s report of the coalition striving to come up with a sustainability index for the 150,000 items at Walmart. Curt Ellis, co-creator of the movie King Corn, pitched his program FoodCorps – an AmeriCorps program to build Farm to School programs. He also shared startling statistics I had not heard before: “We have more people living in prisons in America today than we have left to make a living as farmersâ€ and “Military leaders call [our obesity epidemic] a crisis of national security; already 27 percentÂ of young men and women in America wouldn’t qualify for military service because they are too fat to fight.â€ Michigan is one of the inaugural states where you can apply for the FoodCorps program, courtesy of their partnership with C.S. Mott at MSU. Click here if you are interested in applying. We learned about vegetables growing in the Bronx, rural food deserts in Iowa, and Blue Hill at Stone Barns Chef Dan Barber’s love affair with a Spanish fish (see below). Being there in person was exhilarating, from Friday night drinks to the end of the conference on Saturday. The attendees ranged in age (voice cracking to silver hair), geography (Italy to Berkeley), and vocation (farmers (both of the meat and veggie variety), food centric filmmakers, doctors, farm-to-school experts, bakers, academics, chefs, restaurateurs, social justice advocates, horticulturists, writers, etc). My choice to (mostly) eat with the seasons has spilled over to a greater appreciation to living with the seasons. Wintertime is a time of education, of reflection, of recharging, of planning before the abundance of spring bursts forth and hands dive into dirt. 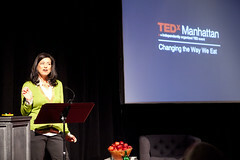 The TEDxManhattan was more than I could have hoped for – in all of those categories.